However, God has a better plan for our time. When we take on tasks never meant to be “under our circus test”, we feel more spiritually, emotionally and physically drained than when we actually started. Good, beautiful and even church-related tasks, can be obstacles in finding the God-ordained rhythm of our lives. Like looking for the perfect combination of flowers for a bouquet, we can’t pick every single flower in the flower shop. Beautiful opportunities may cross your path, but you can’t say yes to them all. Just because you can do anything doesn’t mean you can do everything. 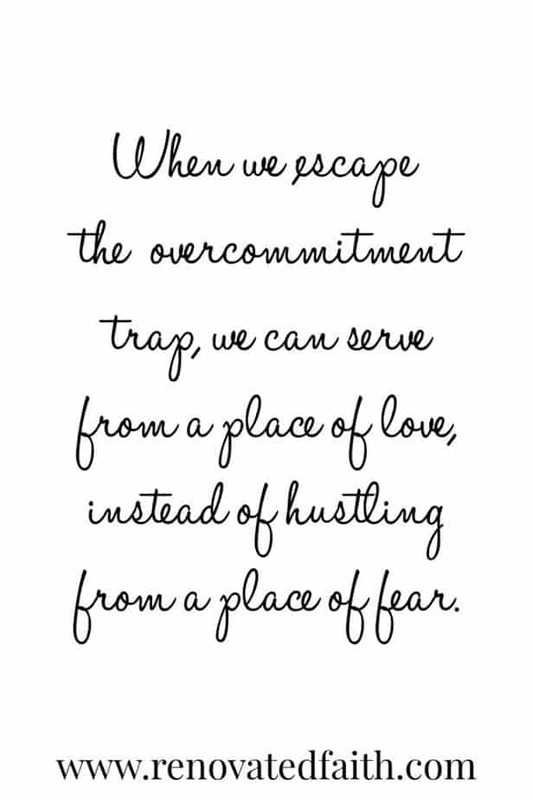 When we finally escape the overcommitment trap, we can serve from a place of love instead of hustling from a place of fear. 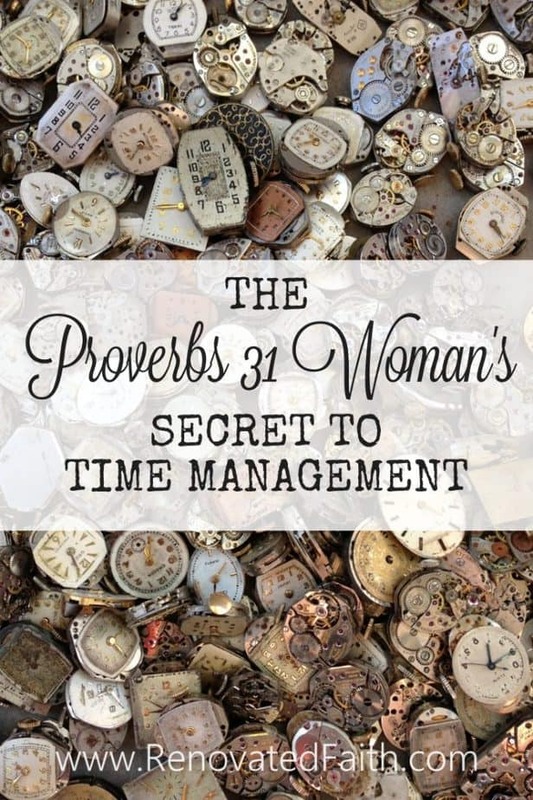 In Proverbs 31, we find the “woman of noble character” doing it all effortlessly. She’s runs a business, gets up early, takes care of her children, keeps the house spotless and has, no doubt, mastered the Instant Pot! If we don’t read Proverbs 31 carefully, we may deduce that being a Godly woman requires doing ALL the things and doing them ALL well. From verse 27, we see that’s not what the passage is saying at all. The Hebrew word for “looks well” actually means to “guard like a watchman” and the “ways of her household” can also mean the “affairs or procession of her household”. In other words, she attentively guards the goings-on of her life and household. The second part of the verse shows the other extreme, illustrating that that although she is careful to guard against the unnecessary, she also does not give into idleness. 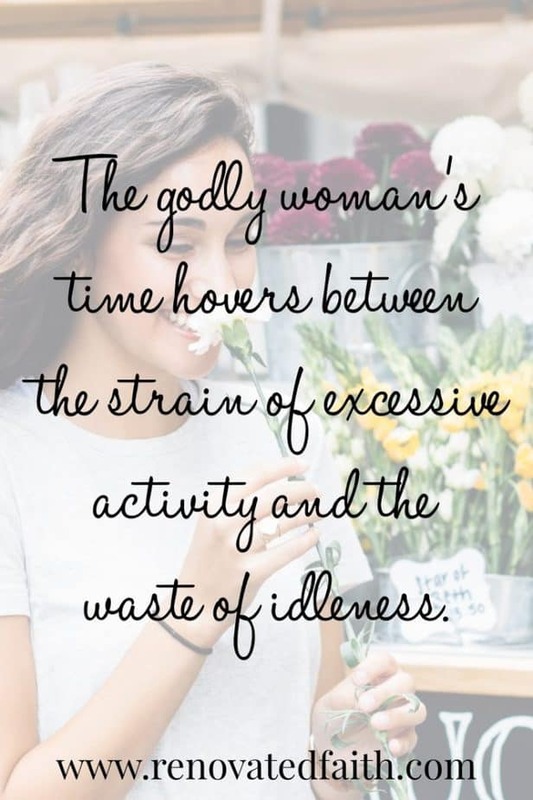 The godly woman’s time is most beautiful and pleasing to Her Father when it hovers between the strain of excessive activity and the waste of idleness. Proverbs 31 describes the height of female effectiveness, which is unattainable for any one woman. 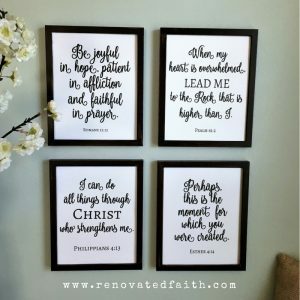 This poem gives us examples of how a godly women stewards various tasks in and outside the home. 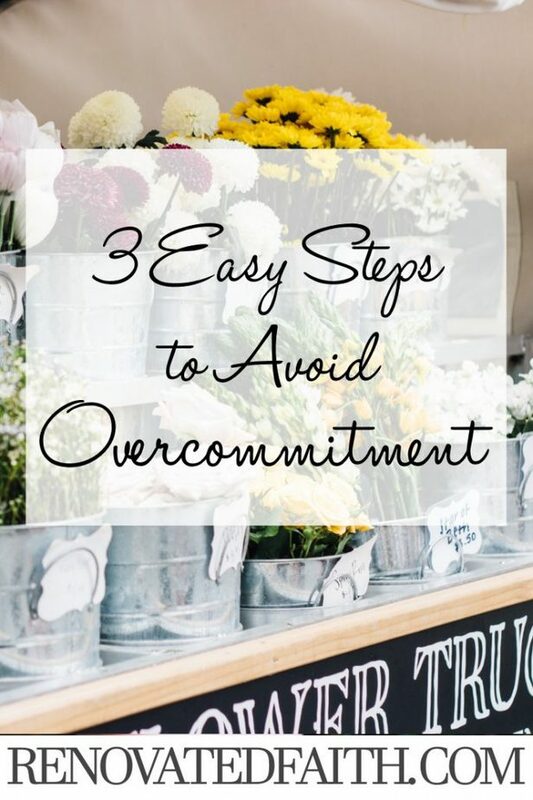 When we try to do it all, we quickly become ensnared in the overcommitment trap. 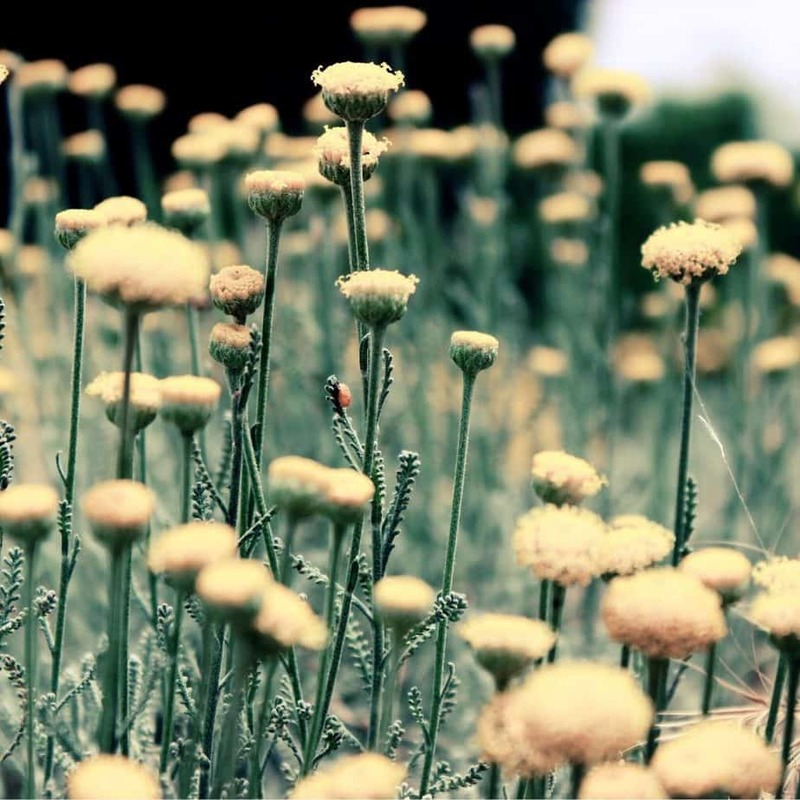 The color fades, the beauty vanishes, and our physical and emotional health eventually becomes fragile. God’s best for us involves diligently protecting our time and resources. We must be on constant alert against tasks that could take our attention away from our God-given priorities. Do you find yourself running at an unmanageable pace? Here are some clues to help you determine if your three-ring circus has a few too many acts. If you can say yes, to 3 of these 6 examples of overcommitment, there’s a good chance you need to re-prioritize. Do you feel constantly overwhelmed and controlled by your agenda? Do you have trouble sleeping because your to-do list is running through your mind? Do you have a hard time finding a time to rest? Do you find yourself bitter towards your commitments? Do you have a hard time remembering the last thing you enjoyed something on your to-do list? A few months ago, I decided I would be “super efficient” by refinishing three large pieces of furniture simultaneously. That included a roll-top desk, and two secretary desks (one of which I featured in my post How To Paint Laminate Furniture). Before I knew it, I had 27 different drawers scattered around my guest room and office, not to mention disassembled pieces of furniture on both sides of our garage. After several weeks, I finally got the desks sanded, primed, painted and re-assembled for their rightful owners. I had no time to spend with my daughter, the house was a mess and my writing was put on hold. If I had finished one desk at a time, I would have used my allotted area in one side of the garage and had plenty of space in my life for my other priorities. Instead I felt overwhelmed, stressed, and bitter about the whole project. The furniture was beautiful but my heart was an ugly mess. Every aspect of our lives and household struggles to function normally. We don’t have the extra capacity to handle life’s hardships because our resources are already depleted. Whether resulting from over commitment to work or over commitment in relationships, we don’t have extra space in our lives to be generous to others. As I mentioned in my post 5 Ways To Stop Comparing Yourself to Others, everyone’s plate looks different. Although another woman might have different responsibilities or more of them, we only worsen our burden by comparing ourselves with her. It’s important to know your tendencies. Often I feel overcommitted when I believe the lie that I CAN do it all! The opposite is true, however. Remember, friend, you can do anything, but you cannot do everything. First things first. – God’s blessings are the natural result of spending daily time with Him in prayer and Bible study. 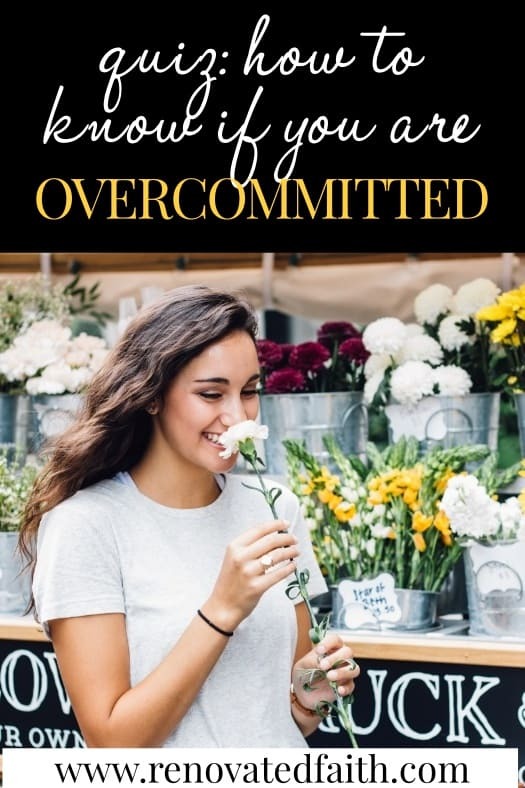 Overcommitment quotes and sayings are great but remember the incredible power of Scripture to encourage you and strengthen you as you find your way out of the overcommitment trap. Find one verse and make it your mantra, repeating it every time you feel overwhelmed or the need to take something else on. Psalm 16:6 above is a perfect example. You have one job. – Remember your one responsibility is to be obedient to Him and He will take care of everything else. Chaos results when something enters our tent that should not be there. Stop before saying “yes” to everything. Give yourself some time to think and pray about it before giving an answer. Have a phrase ready like “I’ll think about it and get back to you” to ensure you don’t overcommit. Robert Louis Stephenson once said, “Perpetual devotion is only to be sustained by perpetual neglect of many other things.” It takes as much discipline to say “no” to the wrong things as it does to say “yes” to the right things. Saying “yes” to something, no matter what it is, means saying “no” to something else because we only have a set number of resources. When we lose our margins and push right up to the edge of our boundaries, we rob from the things that matter most – God, kids, your husband, rest, etc. We also negate the possibility of being generous with our time, resources and money. When we break free from the overcommitment trap, we can serve from a place of love instead of hustling from a place of fear. Know your life was made for so much more than “busy work”. Rest assured, your Heavenly Father sees beauty in your ability to rest, understanding that time belongs to Him. When we create space in our lives, He fills it with blessings that naturally flow from honoring Him. Proverbs 31:25 says the godly woman “laughs at the days to come”. In guarding her time to honor Him, she does not live in fear or dread of what comes next. She can rest knowing that time is not her taskmaster. May peace and joy reign in your heart knowing that God will faithfully finish what He has started in your life. 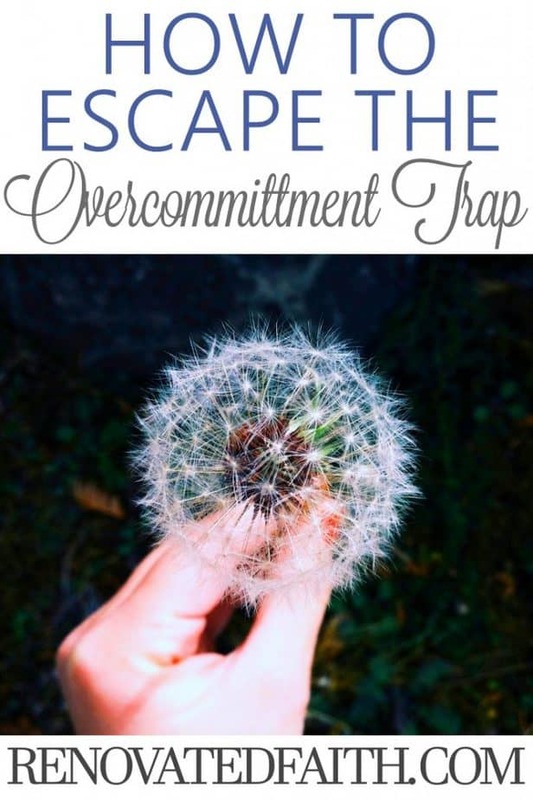 Loved your article, “How to escape the overcommitment trap!” So important to remember . Thanks for your insight and tips! Thank you so much for stopping by Brooke! So often I assume that once I learn something about how to walk better with God, it should be an automatic. However, these are some truths that I have to “put on” daily in order to protect the boundaries He has set. Thank you for reading! I love this! It is so easy to get overwhelmed with what we think we should be doing. Last year I did the bible study: Have a Mary Heart and a Martha world and the study helped me so much with knowing what God has asked and what I add on. Excellent thinking expressed here in your blog. I loved your analysis of Proverbs 31. I often fall into the trap of biting off more than I can chew. I just love to push as much as I can into any 24 hour period, but I do tend to overcommit and we all suffer. I could feel the peace coming off your advice to limit yourself and pause before saying yes.